Routes Interstate I-295 and Virginia Route 288 are freeways which comprise the beltway around Richmond, Virginia. Construction contracts were awarded in 1999 and 2001 for all the remaining projects to complete the western portion of VA-288, and the sections were opened to traffic in 2002, 2003 and 2004. Click to go to LATEST INFORMATION UPDATE. 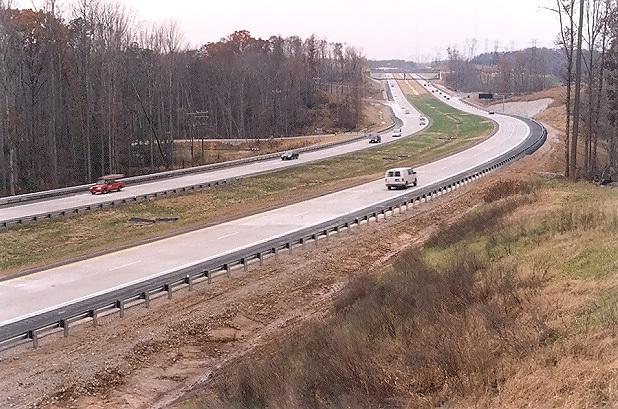 Construction on the 16.1-mile-long southern portion of Virginia Route 288 in Chesterfield County, between Interstate I-95 and VA-76 Powhite Parkway, was completed in 1990, with total costs for the section of $143 million. The construction sequence follows.  The 2.7 miles of Route 288 between US-360 Hull Street Road and VA-76 Powhite Parkway was funded and built as a part of the toll revenue bond financed Powhite Parkway Extension program, with a $22 million Chesterfield County bond issue, and Route 288 is toll-free, and this section opened to traffic in November 1988 at the same time that the Powhite Parkway Extension tollroad opened between VA-150 Chippenham Parkway and VA-652 Old Hundred Road. Legislation of the General Assembly in 1983 (Senate Bill 304) provided for an extension of tolls on the I-95 Richmond-Petersburg Turnpike until 1992, and for the usage of the toll revenues for five local road projects. One of the projects funded via S.B. 304 was the 5.5 miles of Route 288 between US-1/US-301 Jefferson Davis Highway and VA-10 Iron Bridge Road in Chesterfield County. The 6.9 miles of Route 288 between VA-10 Iron Bridge Road and US-360 Hull Street Road, was funded by a $30 million Chesterfield County bond issue. The 1.0 mile of Route 288 between Interstate I-95 and US-1/US-301 Jefferson Davis Highway, was funded by conventional state and federal highway trust funds. The westerly-to-southerly ramps at the VA-288/VA-76 interchange were opened in January 1994, funded by conventional state highway trust funds, and the portion of Powhite Parkway west of Route 288 is toll-free. Design approval for the southern section of Route 288 occurred in the early 1970s and nearly all its necessary right-of-way was acquired via advanced right-of-way acquisition by the late 1970s, but due to funding limitations, the right-of-way stood unused for many years before the funds were found to construct the highway. All of the projects (design, right-of-way acquisition, and construction) were administered by Virginia Department of Transportation (VDOT). So it can be seen that four different types of funding was utilized to build the 16.1-mile-long southern portion of Route 288. This is an excellent example of innovative financing of highway projects. Construction on the 16.7-mile-long western portion of Route 288 started in Spring 1999, and is heading for a late 2004 completion date. The entire Route 288 highway is 32.8 miles long. The VDOT news releases about the projects for the western section of Route 288 commonly referred to the total length of the western section as 17.5 miles, and that number refers to the distance between the southern limit of construction and the northern terminus at I-64, and that total length includes 0.8 mile of widening of the pre-existing Route 288 from Route 76 southward, and the 16.7 miles of 1999-2004 newly constructed Route 288 highway north of Route 76. 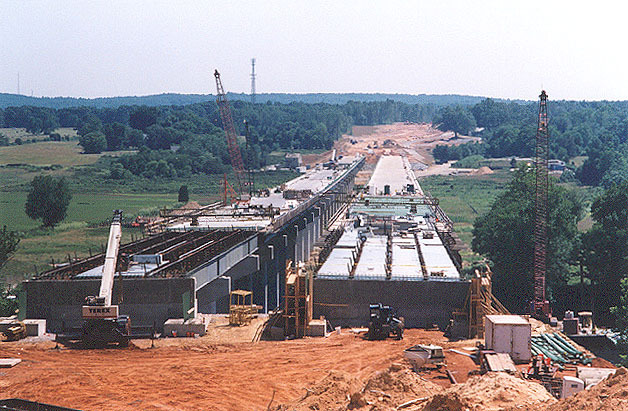 Above, looking south, photo taken by Scott Kozel in early June, 2002, construction of the twin span 3,642-foot-long Route 288 James River bridge. At that point, all of the bridge columns had been built, all of the pier caps on top of the columns had been built, the north abutments had just been completed, the last beams had been placed, and roadway deck construction was nearing completion on both bridges. The bridges were completed in August 2002. The bridge is of a concrete girder design (steel girders for the over-river spans), with two spans each with two lanes and full right shoulders. I'm standing in Goochland County and on the opposite side of the river is Powhatan County. The James River is about 500 feet wide at this point. The length of these bridges is dictated by the large flood plain of the James River, since a large flood such as the ones associated with Hurricane Camille in 1969 and Hurricane Agnes in 1972 (downgraded to tropical storms by the time that they dumped huge amounts of rainfall in the western part of Virginia), can cause this section of the river to rise 20 to 25 feet above flood stage. Click the following images for larger images. The top four images are the twin 3,642-foot-long 29-span VA-288 James River Bridge, and the bottom two images are looking north at the VA-288/Lucks Lane interchange. The photos were taken on March 4, 2003 by VDOT, and are posted here by their permission, and are cropped by Scott Kozel. The four James River Bridge images link to a large image, and the large image links to a very large image. See my construction photo links below for more photos of VA-288 under construction. Construction on the 16.7-mile-long western portion of Route 288 began in 1995 in Goochland County with a 3.6-mile-long project between West Creek Parkway and US-250 Broad Street Road, and the project was completed in late 1997 as a 2-lane freeway on a 4-lane right-of-way, at a cost of $20 million. Construction began in spring 1999 on the $25.2 million 2.8-mile-long section of Route 288 between 0.9 mile south of VA-76 Powhite Parkway and 0.5 mile south of Charter Colony Parkway in Chesterfield County, and completion was planned in late 2002, with the actual opening to traffic of the 0.9 mile of Route 288 between Route 76 and Lucks Lane occurring in November 2002. The original plan when this section was placed under construction in 1999, was to first build the collector-distributor (C-D) roadways on VA-288 to serve the VA-76 and Lucks Lane interchanges. These Route 288 C-D roadways are each over a mile long, and each is a 2-lane freeway standard roadway, and the ramps with VA-76 and Lucks Lane connect with the C-D roadways. The C-D roadways would seamlessly connect with the permanent mainline roadways to the south and north of there. Mainline 2-lane roadways, one each way, would be constructed in the future in the median between the C-D roadways, relegating the C-D roadways to their true C-D purposes. Construction began in January 2001 on the adjoining 4.5-mile-long segment of VA-288, between 0.5 mile south of Charter Colony Parkway and the Chesterfield/Powhatan county line, including the US-60 Midlothian Turnpike interchange and the Woolridge Road interchange. Like with the project that includes the Route 76 and Lucks Lane interchanges, the second project that includes the US-60 Midlothian Turnpike interchange was to utilize the C-D roadways at that interchange as interim mainline lanes, with the ultimate mainline lanes to be built in the future. The contract award amount was $47.5 million. The funding for both projects came from normal VDOT transportation trust funds, 7.3 miles of VA-288 at an as-awarded cost of $72.7 million. Each project included all construction items needed to fully complete the respective segment of highway, including excavation, grading, drainage structures and channels, bridges, pavement, shoulders, guardrail, and signs. When the PPTA $236 million agreement was finalized in May 2001 to build the remaining 10.4 miles of the 16.7-mile-long western section of VA-288 to full 4-lane freeway standards, the PPTA project also included building the aforementioned mainline VA-288 roadways between the C-D roadways in the VA-76/Lucks Lane interchange area and in the US-60 Midlothian Turnpike interchange area, completing the ultimate design of those interchanges. The above 7.3 miles of 2 projects were managed by VDOT in the traditional (non-PPTA) manner, and have concrete pavement. Here is the Project summary: Route 288 page on the VDOT website. 17.5 miles of Route 288 will be built between the Powhite Parkway Extension (Route 76) in Chesterfield County and Interstate 64 in Goochland County. A new segment of Route 288 between Route 76 and Charter Colony Parkway is currently under construction in Chesterfield County. The project is expected to be complete in fall 2001. Construction on the next segment of Route 288, between Charter Colony Parkway and the Chesterfield/Powhatan county line, is scheduled to begin in late January 2001 with completion set for July 2003. Construction is expected to begin in the spring of 2001 on extending the remainder of Route 288 from the Chesterfield/Powhatan county border to I-64 in Goochland County. Route 288 from Route 76 to I-64 is expected to be complete in late 2003. These two projects provide a Route 288 freeway with four mainline lanes, built to Interstate highway standards, from 0.9 mile south of VA-76 to the Chesterfield/Powhatan county border, including interchange expansion at VA-76 Powhite Parkway, and new interchanges at Lucks Lane, Woolridge Road, and US-60 Midlothian Turnpike. In December 2000, VDOT completed a comprehensive agreement with a private partnership to complete the western portion of Route 288. The Virginia Department of Transportation (VDOT) accepted an innovative proposal to build Route 288 in Powhatan and Goochland counties under the Public-Private Transportation Act of 1995 (PPTA). Secretary of Transportation Shirley J. Ybarra and VDOT Commissioner Charles D. "Chip" Nottingham reached a comprehensive agreement with APAC-Virginia, Inc. at the University of Richmond on December 18. The $236 million agreement calls for the completion of Route 288 from the Powhite Parkway (Route 76) in Chesterfield County to Interstate 64 in Goochland County in late 2003. The project will build new segments of Route 288 in Powhatan and Goochland counties and fully develop portions of Route 288 in Chesterfield and Goochland counties, finishing a planned western loop around Richmond. This $236 million in funding will allow the whole 16.7-mile-long western portion of VA-288 to be built immediately to its full ultimate design as an Interstate-standard four-lane freeway with 10 interchanges. The previous plan was to build it with normal VDOT funding, and it would have provided a freeway that was mostly two lanes on a four-lane right-of-way, with four lanes between VA-76 and US-60, and two lanes for the 11 miles between US-60 and US-250, and four lanes between US-250 and I-64; and a parallel two-lane roadway would have been added to the two-lane section in the future when funding became available. So this public-private partnership agreement was good news indeed for Virginia and the Richmond area. The PPTA project included all construction items needed to fully complete the respective segment of highway, including excavation, grading, drainage structures and channels, bridges, pavement, shoulders, guardrail, and signs. The public-private partnership agreement had a fixed cost of $236 million and a fixed completion date of the end of October 2003, and an incentive clause written into the agreement that it would cost the contractor team a penalty fee of $25,000 per day that the completion was delayed beyond that date. Given the construction start date of May 31, 2001, the contractor team would have 29 months to build the project. Virginia's PPTA: Public-Private Transportation Act (PPTA). The western portion of Route 288 is toll-free, to honor a general political commitment that the state government made with Chesterfield County around 1985, that since the county believed that it has had more than its share of toll highways over the years, that the VA-288 beltway would be built without tolls. The $236 million agreement with the developer, APAC-Virginia, Inc., involved the private developer issuing bonds to raise the capital for the project ($236 million), and the Commonwealth Transportation Board has an installment payment schedule worked out to pay the private investors principal and interest from state transportation trust funds, so that the investors can recoup their investment. The estimated sum of construction costs for all of the projects on the 17.5-mile-long western portion of VA-288, as of the May 2001 date of the Notice to Proceed for the PPTA project, was $328.7 million. The Virginia Department of Transportation (VDOT) joined forces with the private sector to begin construction on completing the western loop around the Richmond area. After years of extensive public involvement and planning, followed by months of careful negotiations with the private sector, ground was broken today to launch the building of Route 288 in Goochland County. When completed by the end of 2003, Route 288 will be extended by 17.5 miles from the Powhite Parkway in Chesterfield County to I-64 in Goochland County. "It is another fine example of government and business working together to provide a major public works project in a way that saves taxpayer dollars and takes much less time to complete than we've come to normally expect," said Transportation Commissioner Charles 'Chip' Nottingham. Last December, VDOT entered into a public private partnership with APAC-Virginia Inc. of Danville, Virginia to complete Route 288. APAC-Virginia is working in partnership with CH2MHILL of Herndon, Virginia and Koch Performance Roads of Wichita, Kansas. This unique and innovative partnership was made possible by the Public-Private Transportation Act of 1995 (PPTA). As the news release said, the contractor APAC-Virginia, Inc. is from Danville, Virginia, and APAC-Virginia worked in partnership with the contractors CH2MHILL of Herndon, Virginia, and Koch Performance Roads of Wichita, Kansas. Work has begun on the final phase of state Route 288 in Goochland County. The 17.5 miles of road - part of the western loop around Richmond - will cost an estimated $236 million and should be complete by 2003. [...] State Route 288 is the third major road project under the Public-Private Transportation Act of 1995. Three private construction companies headed by APAC-Virginia Inc. of Danville will lay pavement from the Powhite Parkway in Chesterfield County to the south end of an already completed 3.9-mile stretch of state Route 288 between state Route 6 and U.S. 250 in Goochland, and from the other end of the completed stretch to Interstate 64. Work will include building a 3,642-foot-long bridge across the James River. Route288.com (VA 288) - Richmond, Virginia - contractor project team website. Route 288 has asphalt pavement on the 10.4-mile-long northern portion, in Powhatan and Goochland counties. All paved shoulders on the entirety of Route 288 are comprised of asphalt. I asked the Route 288 project engineers for a copy of the typical section of the Route 288 asphalt pavement, and they said that there was no one single typical section for the asphalt pavement, that VDOT allowed the use of various approved typical sections based on local site conditions. I may eventually get the details of all of these, but for now I will provide the typical section that was commonly utilized on the Goochland County section of Route 288. My surmise is that this is fairly near the average and that they do not vary substantially. The one obvious thing that I observed while personally observing Route 288 paving operations, is that in areas of soft soil, that an extra one to two feet of depth was excavated under the proposed roadway, and the extra depth was filled with crushed stone subbase material that was compacted; and the normal pavement structure was built on top of that. Notes: kg - kilograms, m2 - square meters, mm - millimeters. The Open Graded Drainage Layer is comprised much like a somewhat course layer of asphalt concrete. Aggregate Base Material is not asphalt concrete, it is a mixture of crushed stone about 1/2 inch and less in size, and much finer crushed stone that is the size of sand. Each of these layers are heavily compacted by roller vehicles after placement of the layer. The above pavement design works out to a 14-inch depth of asphalt concrete on top of 6 inches of crushed stone subbase material. This for the Route 288 mainline roadways; the design for the paved shoulders would be somewhat thinner. The western portion of VA-288 originally was proposed extending from today's VA-288/VA-76 junction, through Midlothian, to the junction of I-64 and I-295 west of Richmond. After location studies in the late 1960s, this route location was approved by the Virginia State Highway Commission in 1969. 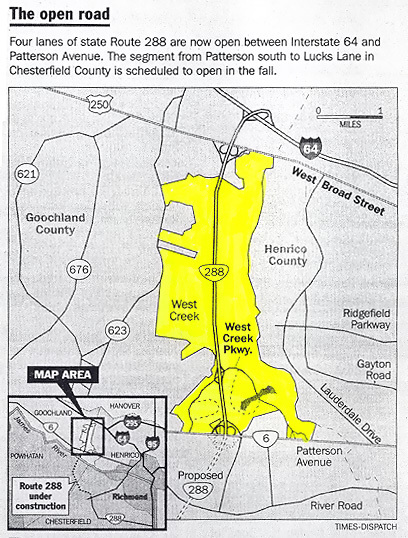 The proposed location for the western portion of VA-288 was abandoned by the Commonwealth Transportation Board (former VSHC) in 1988, due to extensive later development along portions of the route in Chesterfield and Henrico Counties (28 businesses along US-60 in Midlothian would have been razed by the original location); that is when the present western location of VA-288 was approved by the CTB, and this location passes through the eastern corner of Powhatan County and the eastern portion of Goochland County, interchanging I-64 about 1/2-mile west of the Goochland/Henrico County Line. In Goochland County, the private developer of the West Creek Business Park offered 4.0 miles of right-of-way, free of charge, to the Virginia Department of Transportation (VDOT), for the portion of VA-288 that passes through their property, and VDOT accepted the donation of the right-of-way. A 4-lane arterial highway location was also approved by the CTB in 1989, the John Rolfe Parkway, as an extension from I-295 southward from I-64 to Gayton Road. About 1.2 mile of the John Rolfe Parkway has been built from Gayton Road to Ridgefield Parkway, but most of the parkway remains unbuilt. See my article Richmond Beltway (I-295 and VA-288) for a map of that facility as originally envisaged. Spanning 3,500 beautiful acres - nearly five miles from north to south - West Creek is one of the East Coast's largest master-planned business parks located in an emerging technology corridor west of Richmond. West Creek is an excellent destination for office, high-tech, R&D, distribution, retail and hotel sites. - 3,500-acre master-planned business park. - Phase 1 Audit has been completed and wetlands have been identified and reviewed by the Corps of Engineers for the entire 3,500 acres. - Water, sewer, electricity, natural gas and fiber optics. - 40-acre lake in Phase 1. Just west of Richmond, on 3,500 sprawling acres, lies the West Creek Business Park, one of the East Coast’s largest master-planned business parks. The county has high hopes that West Creek will be a leading landmark destination for office, high-tech, research and development, distribution, retail and hotel sites. And Capital One, a Virginia-based financial services company, is carving out about 300 acres in West Creek to develop one of three planned campuses in the area. The other two office campuses are in Henrico County and Chesterfield. When the overall $700 million expansion including Capital One’s new headquarters building in McLean was announced in October 2000, it was the largest expansion ever recorded in Virginia history. At the present time Capital One has completed two 160,000 square-foot facilities as part of Phase One. The office buildings are connected by a common structure that serves as a dining and collaborative area for the employees. The two structures were completed earlier this year, with the first structure being occupied in January and the second one occupied in May. Plans are currently underway for Phase Two, which includes additional office buildings and amenities, including a training and conference center. The West Creek Business Park is attracting other businesses to the Goochland County area. Presently, the Farm Bureau of Virginia and Performance Foods each have their corporate headquarters located in West Creek. 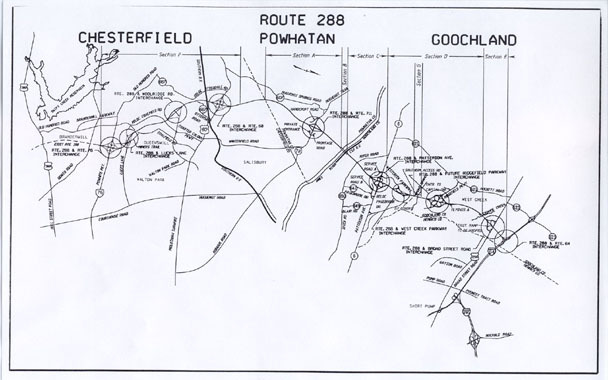 This map shows the area around Route 288 in Goochland County. I highlighted with a yellow marker the West Creek Business Park, and it can be seen how VDOT's Route 288 highway project benefited from 4.0 miles of right-of-way which was donated free of charge by the owners of the Business Park who will benefit by the highway access, and this section with the donated right-of-way doesn't affect adjacent homeowners since there are none. The huge size of this property is apparent (3,500 acres is 5.47 square miles). Tuckahoe Creek runs north-south and forms the eastern boundary of the Business Park as well as forming the Goochland / Henrico County Line. Click for larger map image: Large (134 kilobytes). The following passage details the history of Route 288 up through 1988. 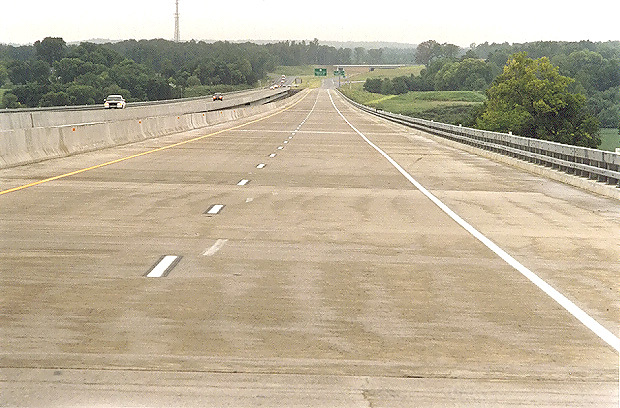 PROJECT HISTORY: The Route 288 study effort was initiated 21 years ago when the Virginia Department of Highways (now VDOT) received a resolution from Chesterfield County requesting the construction of an outer circumferential roadway. Several alignments were studied in September 1966 by the then Virginia Department of Highways (now VDOT). Route 288 was incorporated in the 1980 Thoroughfare Plan for the Richmond metropolitan area, prepared by Wilbur Smith and Associates (1968). A Location (Public) Hearing was held in October of 1967. Approximately 70 people were present, including the owner of the Tuckahoe Plantation in Goochland County, who objected to the alignment presented at the Hearing. In August, 1969, the Virginia Highway Commission adopted resolutions approving the corridor location for proposed Route 288 from the intersection of Route 250/I-295 (now I-64/I-295) in Henrico County to Route 360 in Chesterfield County, and from Route 360 to I-95/Richmond-Petersburg Turnpike (RPT), also in Chesterfield County. The route was also approved as a full control of access facility and added to the State Primary System. Route 288 was again incorporated into the Metropolitan Planning Organization's (MPO) 1985 Major Thoroughfare Plan for the region (May 1971). In 1971, a court injunction was filed against the project which required the state to investigate other prudent and feasible alternatives for the location of Route 288 which would not impact the Tuckahoe Plantation in Goochland County. In June 1973, the Virginia Department of Highways (VDOT) began studying alternatives to avoid Tuckahoe Plantation. Chesterfield and Henrico County Supervisors again urged the Department to complete the planning process for the portion of Route 288 north of Route 360. New studies were initiated for its location between I-64 west and Route 360, southwest of Richmond. In 1978, a consultant was retained for preliminary engineering, traffic and environmental studies for this northern leg of Route 288. The study was terminated in 1980 due to escalating costs and the lack of highway construction monies for Route 288 in the foreseeable future. In March of 1986, Chesterfield County, with support from Henrico and Goochland Counties, adopted a resolution requesting the MPO to ask VDOT to begin a study of Route 288. (The MPO's current 1995 Transportation Plan for the region adopted in May 1980 identified Route 288 as a "Proposed New Facility.") In response, the MPO requested that an Environmental Impact Statement for Route 288 be prepared, having a study area that was bound by Powhite Parkway on the south, the Department's previously approved alignment for Route 288 on the east, an alignment west into Powhatan County and extending north to the terminus of the John Rolfe Parkway, north of Route 6. On January 15, 1987, VDOT retained Harland Bartholomew & Associates, Inc. to conduct the preliminary engineering, traffic and environmental studies necessary for Route 288 within the general study area set forth in the MPO March 1986 resolution. PROJECT NEED: The 1995 Major Thoroughfare Plan called for new roadway construction for Route 288, the Parham / Chippenham Connector (under construction), the Powhite Parkway Extension (under construction), Gaskins Road Extension (completed), Ridgefield Parkway, I-895, and I-295 south of I-64 east of Richmond (under construction). These roadways were deemed necessary in order to accommodate projected growth. Route 288 plays a significant role in the plan as it circumvents the western and southwestern portions of the Richmond Metropolitan Area. It will serve as a component in the circumferential roadway network around Richmond and accommodate several types of vehicular trips. First, it will serve as a connection between radiating arterials from the core of the region and promote interaction between land uses along these arterials. Secondly, it provides an additional James River crossing to alleviate projected congestion on other bridges in the western part of the regional area. Finally, it will provide an alternate travel route between I-64 to the northwest and I-95 to the south, thereby allowing through trips to avoid the downtown area and utilize Route 288 as a bypass route. This map of alternates comes from VDOT's Route 288 Corridor Study, Summary Report, Location Public Hearing for Virginia Department of Transportation, from Interstate 64 to U.S. Route 360, published in 1988 (the above cited report). Alternate 9, the easternmost (bottommost) alternate, is the one which most closely followed the original location approved by the Virginia State Highway Commission in 1969. It can be seen, that one of the alternates would have been to the west, south of the James River, and along the original location north of the James River. Alternate 4 MOD is the alternate that was approved in 1988. Notice that the North Arrow points "right". Click for larger map images: Medium (149K), Large (200K), Extra Large (387K). The largest image is the best one for clearly seeing the route numbers and road names. The above Route 288 Corridor Study was conducted because of the requests of many citizens and local elected officials in both Chesterfield County and Henrico County, to re-evaluate the previously approved location for the western section of Route 288, with the study of new alternates to the west of the previously approved location. There was a lot of citizen sentiment in both Chesterfield County and Henrico County, for a full "western route" to be chosen for Route 288, and the eastern route to be cancelled. I attended one of the 1988 CTB meetings about the topic, and some citizens had "Go West 288" signs that they held up in the meeting, and at that time quite a few cars in both counties sported "Go West 288" bumper stickers. The Commonwealth Transportation Board withdrew the formerly approved eastern route, and approved the Alternate 4 MOD "western route", in a resolution passed in December 1988. After the Public-Private Transportation Act of 1995 (PPTA) was enacted by the General Assembly of Virginia, there were proposals by 2 different private consortiums to fund and build the western section of Route 288 as a tollroad, with the tolls to be utilized to recoup their investment. Many citizens and elected officials in Chesterfield County voiced opposition to having tolls on Route 288, saying that the county had "more than its share" of tollroads over the years. I-95 in the Richmond-Petersburg corridor was tolled from 1958 to 1992, and the entire "southwest expressway" corridor (Downtown Expressway, RMA Powhite Parkway, Powhite Parkway Extension) in the Richmond area, is tolled currently and will be tolled into the foreseeable future. The county formed the 288 Freeway Committee in 1996 to lobby the state government for sufficient funds to build the highway without tolls, and their input helped to secure those funds. Route 288 will provide a four-lane, interstate-style link between western Chesterfield and Henrico counties by way of eastern Powhatan and Goochland counties. Route 288 will have no tolls and will be known as the World War II Veterans Memorial Highway. The final 17½ miles are still expected to open to traffic in the fall, but probably after the project's Oct. 31 deadline, according to the Virginia Department of Transportation. The VDOT-managed portion of the project, from the Powhite Parkway to Midlothian Turnpike in Chesterfield County, is expected to open by mid-November, according to Jeff Caldwell, a VDOT spokesman. That includes a half-mile section from the Powhite Parkway to Lucks Lane that opened in November . The remaining work is being done by APAC-Virginia, under the Public-Private Transportation Act. The company's contract calls for a fixed price of $236 million and a completion date of Oct. 31. The company will be fined $25,000 per day if that deadline is not met, Caldwell said. Actually the northern limit of VDOT-managed portion of the project is two miles north of Midlothian Turnpike -- at the Chesterfield County / Powhatan County boundary. The public-private partnership agreement had that incentive/disincentive clause written into the agreement. With the contractor team going over that deadline of the end of October 2003, it will behoove them to make it as few days as possible, as the financial penalties would mount up quickly. Also, by minimizing the number of overrun days should the project run late, that may increase their chances of justifying the late days to VDOT, if they want to try to make the case that they faced extenuating circumstances that might warrant waiving the financial penalties for some certain number of days. VDOT does not want to bust the contractor, they want him to be successful. However, if the contractor team winds up several months late, I personally doubt that they will avoid paying some pretty hefty financial penalties. If measured in working days (say 22 days per month), that would be $550,000 per month. The contractor team was ahead of schedule during the first two years of construction on the 16.7-mile western section of Route 288, which would be through May of 2003. Heavy periodic rains began in the Spring of 2003, extending through early 2004, washing out any hope of completing Route 288 by October 31, 2003, as originally scheduled. The western section of Route 288 is being built in three projects between the Powhite Parkway Extension (Route 76) in Chesterfield County and Interstate 64 in Goochland County. One VDOT-managed segment of Route 288 stretches from Route 76 to Charter Colony Parkway in Chesterfield County and the other VDOT-managed segment stretches from Charter Colony Parkway to the Powhatan County line. APAC-Virginia, Inc. oversees construction on the rest of Route 288, from the Powhatan County line to I-64 in Goochland County, funded under Virginia's Public-Private Transportation Act of 1995. The Lucks Lane overpass and a portion of Route 288, from Route 76 to the Lucks Lane interchange, is already open to motorists. The rest of the project is expected to be completed in mid-2004. The Virginia Department of Transportation (VDOT) and APAC-Atlantic, Inc. are going to allow motorists to experience the benefits of Route 288 this fall, even though the entire Route 288 corridor from the Powhite Parkway in Chesterfield County to I-64 in Goochland County will not likely open to traffic until mid-2004. VDOT and APAC have assessed progress of the 17.5-mile Route 288 construction project and delays that will prevent the project from opening in its entirety by its original completion date of Oct. 31, 2003. In an effort to minimize the impact of these weather-related delays on motorists, the project team will open Route 288 in phases as segments are completed and can safely carry traffic. The first phase will open the interchange and road segment linking I-64 to Route 250 in Goochland County by the end of 2003. This will allow motorists on I-64 easier access to Western Henrico County and to Short Pump Towne Center in time for the holiday shopping season. Phase two calls for opening Route 250 to Route 60 in early 2004, including a brand-new James River crossing. The last phase opens Route 60 to Route 76 in mid-2004. The holiday-traffic forecast at Short Pump Town Center just got a bit jollier, thanks to an early Christmas gift from the Virginia Department of Transportation. A portion of the new Route 288 between Interstate 64 in Goochland and West Broad Street - about one mile of the entire project - will open sometime this fall, state road officials announced yesterday. The road will improve access to Short Pump. "The first segment is a very small segment," said Jeff Caldwell, VDOT spokesman. Though small, "that area will open up a new highway interchange and will allow traffic trying to access western Henrico and the West Creek business park to access those areas." Perhaps most significantly, it provides another approach for holiday shoppers intent on reaching Henrico's new mega-mall, which currently relies on a single interstate access point nearly two miles away. VDOT and APAC declined to set a firm date for opening the segment of road, instead indicating that it would be "late fall" - in time to accommodate holiday shoppers. The 3.6-mile-long section of Route 288 between West Creek Parkway and US-250, was opened to traffic in 1997 as a 2-lane highway on a 4-lane limited access right-of-way. Opening the Goochland County section of Route 288 would include the completion of that section to full 4-lane freeway standards. Construction season is now underway, and the Route 288 PPTA project team has a plan of action for completing the delayed project. The delayed project completion stems primarily from the wet weather the area received between late 2002 and late 2003, which included some of the highest rainfall amounts on record. The rain and mud made the majority of construction activities virtually impossible to perform. Some of the work underway at the time needed to be repaired or redone once the rains stopped. All of this amounted to additional work, additional testing, and additional frustrations for motorists anxiously awaiting the opening of Route 288 between I-64 and Route 76 (the Powhite Parkway). Rick Fischer, Project Manager for APAC, said that many of those motorists have been e-mailing and calling, asking for updates. "Over the winter we spent a lot of time assessing all the site conditions and impacts the rains had on the project. We developed a revised work plan and schedule that is now complete. The plan allows for phased completion of project segments to allow motorists to begin using portions of the highway sooner." "This schedule could change depending on weather and site conditions we encounter this spring and summer," said Fischer. He added that APAC's ability to forecast completion dates with greater accuracy would improve as they get closer to their target dates. He added, "VDOT advises us that their portion of the Route 288 project between the Powhatan/Chesterfield County line and Route 76 is scheduled for completion in late summer 2004. This would allow the opening of the segment between Route 6 and Route 60 in late summer. With luck and good weather it is possible that the segment between Route 60 and Route 76 can be opened to traffic by late summer or early fall." The news release goes on to say that the entire project, including the VDOT-managed portion in Chesterfield County, was slated for completion in late summer/early fall 2004 if weather conditions remained normal that spring and summer. This section of my article was developed successively as each section of the highway opened to traffic, with details about the opened section from the perspective of having just driven the new section; and they are in chronological order and they remain as I first posted them (I made minor corrections to section lengths in December 2004). 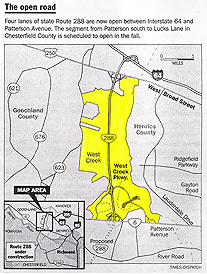 The 0.9 mile of Route 288 between VA-76 Powhite Parkway and Charter Colony Parkway in Chesterfield County, opened on November 20, 2002. Construction began in spring 1999 on the $25.2 million 2.8-mile-long section of VA-288 between 0.9 mile south of VA-76 Powhite Parkway and 0.5 mile south of Charter Colony Parkway in Chesterfield County, and completion was planned in late 2002, with opening to traffic of the 0.9 mile of VA-288 between VA-76 and Lucks Lane (actually on the collector-distributor roadways, as the mainline roadways north of VA-76 are not open yet). It opened on November 20, 2002, and I drove on it that afternoon. It is a short section, but it provides traffic relief for the intersection of VA-76 and Old Hundred Road, and for the traffic that utilizes a portion of VA-76 and Old Hundred Road to follow the route from the current end of VA-288 at VA-76, as it heads to/from US-60 and Midlothian to the north. It also is the first installment of completing the 16.7-mile-long western section of VA-288. 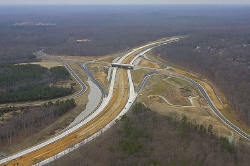 The full cloverleaf interchange between VA-76 and VA-288 was fully opened to traffic. In addition to the two loops and two outer ramps that were open previously, the remaining two loops and two outer ramps opened on Nov. 20. The 0.9-mile-long section of VA-288 between VA-76 and Lucks Lane opened, along with the two southerly ramps of the diamond interchange at Lucks Lane. Route 288 is channeled down to one lane each way between VA-76 and Lucks Lane, by traffic cones. That short section will remain one lane each way until VA-288 is opened to the north of Lucks Lane. The northernmost 1.4 mile of Route 288 opened on December 22, 2003, and this includes the Route 288 interchanges with Interstate 64 and US-250 Broad Street Road. I drove through the above new Route 288 section and interchanges on the night that it opened. This opening involves 1.4 mile of Route 288 between I-64 and 1/2 mile south of US-250, and includes opening the Route 288 interchanges with I-64 and US-250. Just south of the Route 288 Tuckahoe Creek bridges, the newly opened section transitions to the portion of Route 288 that is under construction south of there, 3.0 miles of 2-lane Route 288 that opened in 1997, with its parallel roadway to open in early 2004. There is some construction overlap between the northern section of the 2-lane Route 288, and the section that just opened, so there is now 4.4 miles of Route 288 open between I-64 and West Creek Parkway in Goochland County. West Creek Parkway is a 4-lane arterial that connects to the 4-lane arterial VA-6 Patterson Avenue. So a modern north-south highway now is open between I-64 and Patterson Avenue, paralleling about 1/2 mile west of the Goochland/Henrico County line. The interchange between I-64 and VA-288 is a three-level semi-directional interchange. It has a very ample design, with all 4 ramps being 2 lanes wide and comfortably drivable at 60 mph, and the 4 acceleration and deceleration sections where Route 288 merges into I-64, are each about 3,000 feet long with the ramp smoothly transitioning from 2 lanes to 1 lane, and I-64 carries a third lane each way for the 1 mile of I-64 between the Route 288 and VA-623 Rockville interchanges, with the outer lane each way transitioning into the Route 288 ramps. The 2-lane ramps to Route 288 southbound, merge into a 4-lane roadway, and the outer lane drops into the US-250 loop ramp, and the inner lane drops just before the Tuckahoe Creek bridges. On the Route 288 two-lane northbound roadway, a third lane begins at the US-250 loop ramp, and the outer lane and inner lane each branch into their respective I-64 ramps, and the middle lane branches into 2 lanes on a very gradual gore area, so 3 lanes northbound on Route 288 becomes two 2-lane ramps to I-64 east and I-64 west. So the connection between Route 288 and both directions of I-64, is a full-scale high-speed freeway. Route 288 will be a 4-lane freeway for the rest of the way southward, built on a 6-lane right-of-way. The interchange between VA-288 and US-250 is a half cloverleaf interchange to the south, with full interchange movements provided between the two highways. No ramps were built to the north of US-250, because of the closeness to Interstate I-64; the I-64 interchange with VA-288 is 0.8 mile north of the US-250 interchange. This interchange also has an ample design, with the 2 loops comfortably drivable at 40 mph, and the two outer connector ramps comfortably drivable at 40 mph. The acceleration-deceleration lane on eastbound US-250, between the two loops, is about 2,000 feet long, plenty of room for weaving and merging. US-250 was just widened to a 6-lane divided highway last month. The widening of US-250 has been completed in the area of its interchange with Route 288 in Goochland County, with the second dual roadway opened on about November 15, 2003. US-250 Broad Street Road is now 6 lanes divided from the city of Richmond all the way west to Tuckahoe Creek about 1/2 mile west of Route 288, and about 500 feet west of the new 6-lane bridge over the creek the highway reduces to 4-lanes divided with a median about 50 feet wide, and the western limit of the widening is about 1/4 mile west of Route 623 in Manakin-Sabot; and US-250 is in its original 2-lane configuration from there westward (it has a third lane for left turns only for about 1/2 mile in Manikin-Sabot). The newly dualized US-250 section is about 1.9 mile long, and the western 1.3 mile is actually a separate project from the Route 288 project even though both projects are complementary. The 4.0 miles of Route 288 between VA-6 Patterson Avenue and 1/2 mile south of US-250 in Goochland County was completed on May 1, 2004. This section extends the northernmost 1.4 mile of Route 288 between I-64 and 1/2 mile south of US-250, which opened on December 22, 2003, southward to Patterson Avenue; and these two sections combined amount to 5.4 miles of Route 288 that is now fully complete and open to traffic in Goochland County, between VA-6 Patterson Avenue and Interstate 64. This section includes 1.0 mile of new 4-lane freeway between Patterson Avenue and West Creek Parkway, and 3.0 miles of parallel 2-lane roadway between West Creek Parkway and 1/2 mile south of US-250 (the original 3.6 miles of VA-288 between West Creek Parkway and US-250 opened in 1997 as a 2-lane highway on a 4-lane limited access right-of-way). The new freeway section, the parallel roadway, and 2 1/2 interchanges opened on May 1st, so the entire 4.0 mile section of Route 288 is now a 4-lane freeway. VA-6 Patterson Avenue is a 4-lane divided highway, and 1.1 mile of that highway was rebuilt in the area of where it has a cloverleaf interchange with Route 288, to provide an alignment properly designed to accommodate the new interchange. The rebuilt section of Patterson Avenue was reopened to 4 lanes on May 2nd, as it had been reduced to 2 lanes during the reconstruction. The ramps and loops are open for the northerly Route 288 direction, so 1/2 of the interchange is open. West Creek Parkway is a 4-lane divided thoroughfare, and it has a diamond interchange with Route 288 that includes one loop ramp. Tuckahoe Creek Parkway was completed along its 1.5 mile first section, and it is a 4-lane divided east-west thoroughfare, with a full cloverleaf interchange with Route 288, and the interchange includes a pair of 2-lane high-speed semi-directional ramps that connect northerly Route 288 directly with the Capital One complex that is 1/4 mile west of Route 288. The Capital One business complex is partly built and the rest still under construction, and it will eventually have over 4,000 employees. The Tuckahoe Creek Parkway was fully opened on May 1st (it had a 1/2 mile 2-lane segment between Route 288 and Capital One that opened a year ago), and the Route 288 interchange with Tuckahoe Creek Parkway was opened on May 1st also. Tuckahoe Creek Parkway runs 1.5 mile between VA-623 and 0.6 mile east of Route 288, and it provides access to Capital One. An 0.7 mile "missing link" exists between Tuckahoe Creek Parkway in Goochland County and Ridgefield Parkway in Henrico County, and if that segment is built, the two parkways will form a seamless 4-lane divided east-west thoroughfare with its eastern end at Gaskins Road, 4.5 miles east of Route 288. There are some serious wetland issues with this unbuilt segment of the parkway, to where it may take 1,500 feet or more of bridge length where it would cross Tuckahoe Creek and its floodplain. Actually, earlier in the planning of Route 288, the proposed Tuckahoe Creek Parkway in Goochland County was named Ridgefield Parkway, as the large map below shows, so this would indicate that at least in the past, that this was planned as one continuous parkway in both counties. On May 2, 2004, I drove the entire new section of Route 288 between VA-6 Patterson and 1/2 mile south of US-250, its ramps and its connections. It is a very nice highway. The speed limit is 65 mph on the whole section of Route 288 now open in Goochland County. The pavement is comprised of asphalt. The remainder of Route 288 between VA-6 Patterson Avenue and VA-76 Powhite Parkway in Chesterfield County, is scheduled to open in late summer or early fall of 2004. The 6.7 miles of Route 288 between US-60 Midlothian Turnpike In Chesterfield County and VA-6 Patterson Avenue in Goochland County, including the Route 288 James River bridge, was opened to traffic August 27, 2004. The long-awaited opening of Route 288 between Route 6 (Patterson Avenue) and Route 60 (Midlothian Turnpike) including a new James River Bridge crossing is just a day away. The new route will significantly cut commute times across the river when it opens tomorrow. This segment connects to previously opened portions of Route 288 between Route 6 and Interstate 64 in Goochland County. Once this segment is open, motorists will be able to drive Route 288 from Midlothian Turnpike (Route 60) to I-64 in approximately 12 minutes. This is a significant timesavings over the other available river crossings including Chippenham Parkway’s Willey Bridge and Huguenot Bridge. Typical commutes using these facilities to traverse between the Midlothian and Short Pump areas now last 35 to 45 minutes. Crews will continue to work diligently until the entire corridor is open to traffic. The final portion of Route 288 between Route 60 and Route 76 is slated for completion later this fall, but no exact dates are available at this time. Route 288 was officially named the World War II Veterans Memorial highway and Bridge earlier this month. A section of Route 288 was opened to traffic on Friday, August 27, 2004, 6.7 miles between US-60 Midlothian Turnpike and VA-6 Patterson Avenue. This section extends the northernmost 5.4 miles of Route 288 between I-64 and VA-6, which was fully opened to traffic with 4-lane freeway standards on May 1, 2004. I drove it the day that it opened and the day after. The only section with a reduced speed limit is in the area where traffic is being funneled into the collector-distributor roadways at the temporary southern terminus at US-60 Midlothian Turnpike, and for one mile north of US-60 on the northbound Route 288 roadway where the left lane is open but the right lane is closed with barrels, as there is still guardrail construction underway adjacent to the right shoulder. The rest of Route 288 north of there is fully open to 4-lane freeway standards, with a 65 mph speed limit. The median is grassed and is normally 60 to 72 feet wide (a bit narrower at the James River bridge). It is a very nice highway, and scenic where it crosses the James River on twin 3,642 foot-long bridges. The James River is about 500 feet wide at that point, and the rest of the bridge crosses the wide flood plain of the river, which during non-flood times is land, and at normal river flow the roadway is about 40 feet above the river. These bridges are horizontally straight, and on a slight "sag" vertical curve, so they make an interesting effect when you cross them, and they seem longer than I thought they would seem to be. Each bridge has two 12-foot-wide traffic lanes, a 6-foot-wide left shoulder, a 10-foot-wide right shoulder, a Jersey Barrier type left parapet, and the right parapet is of the dual-heavy-steel-rail design shown on this link, and intent is to provide a parapet that vehicle passengers can see through, while being of a very strong design to resist the impact of heavy vehicles. The two bridges are about 40 feet apart. There is a 'ridge' about 1/4 mile north of the river, where the highway passes through an earthen cut that is about 65 feet deep. A surprising amount of traffic was already using Route 288 between US-60 Midlothian Turnpike and Interstate I-64, not congested, but a good steady volume of traffic. Control cities used on the guide signs on the interchanging highways, for northbound Route 288, is Charlottesville, and for southbound Route 288, is Midlothian and Chesterfield. US-60 Midlothian Turnpike, a 4-lane divided highway, will have a full cloverleaf interchange with Route 288 in Chesterfield County, with collector-distributor (C-D) roadways on Route 288 to intercept all the ramp movements. US-60 passes over VA-288 on twin overpass bridges. The southbound C-D roadway has 2 through lanes. The northbound C-D roadway has one through lane, and I surmise the reason for it being narrower than the southbound C-D roadway, is because a future semi-directional ramp will replace the loop ramp between northbound Route 288 and westbound US-60. The project's design plans show this future semi-directional ramp. A 1.0-mile-long section of 4-lane divided US-60 was reconstructed on an improved alignment, in the Route 288 interchange area, to provide an adequate highway in the interchange area. There is a third auxiliary lane between each pair of loop ramps, where they interface with each direction of US-60, and these auxiliary lanes are over 1,000 feet long, providing plenty of merging space with US-60. Currently, half of the interchange is open, with the two northerly outer connector ramps connecting westbound US-60 to northbound VA-288, and southbound VA-288 to westbound US-60; and with the two southerly loop ramps connecting southbound VA-288 to eastbound US-60, and eastbound US-60 to northbound VA-288, with the loop ramp traffic using the VA-288 C-D roadways. The loop ramps have a large enough radius, that they are comfortably negotiable at 35 to 40 mph. Route 288 crosses over Bernards Creek on twin 570-foot-long curved bridges, just south of the VA-711 interchange, and each bridge has 2 through lanes for Route 288 and one auxiliary lane for the VA-711 ramp. VA-711 Huguenot Springs Road / Robious Road has a diamond interchange with Route 288 in Powhatan County, with the two ramp intersections on VA-711 being controlled by traffic signals. 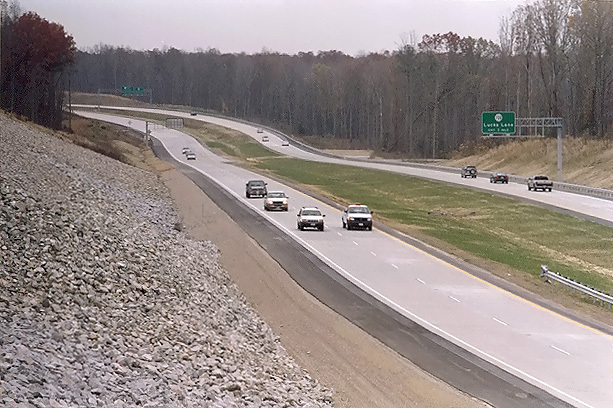 An 0.8-mile-long section of 2-lane VA-711 was reconstructed on an improved alignment, to 4 lanes divided, in the Route 288 interchange area, to provide an adequate highway in the interchange area. The county government has already zoned this mostly-rural area of the county for business, light industrial and residential development, and the adjoining sections of VA-711 will be reconstructed to 4 lanes divided in the future. There is ample space inside the interchange to add 4 loop ramps in the future, should the decision be made to upgrade the interchange to a full cloverleaf design. VA-711 passes over VA-288 on one 4-lane bridge, and the bridge includes a 2-lane area for left turning traffic from eastbound VA-711 to northbound VA-288, and the bridge roadway deck is wide enough to be reconfigured to 2 through lanes and one right auxiliary lane and one 8-foot-wide right shoulder each way, to accommodate the loop ramps in a future full cloverleaf interchange design. When driving on VA-711 across VA-288, the VA-288 James River bridges are easily visible a mile to the north. VA-6 Patterson Avenue, a 4-lane divided highway, has a full cloverleaf interchange with Route 288 in Goochland County. Actually, one movement, southbound VA-288 to westbound VA-6, is handled by a section of West Creek Parkway due to the closeness of the VA-6/West Creek Parkway intersection to the VA-6/VA-288 interchange. The rest of the movements are handled on a regular cloverleaf design. The northerly half of this interchange opened on May 1, 2004 when Route 288 opened north of VA-6, and as of August 27th, the whole interchange is open. The loop ramps have a large enough radius, that they are comfortably negotiable at 35 to 40 mph. On VA-6 Patterson Avenue, 1.1 mile of that highway was rebuilt in the area of where it has the interchange with Route 288, to provide an alignment properly designed for the interchange. VA-6 passes over VA-288 on one 4-lane bridge. The final section of Route 288 to open to traffic will be the 3.7-mile section between Lucks Lane and US-60 Midlothian Turnpike in Chesterfield County, later in Fall 2004; but knowledgeable commuters will be able to utilize a section of US-60, Charter Colony Parkway, and Lucks Lane, to connect to Route 288 on either side of the last remaining gap in Route 288. That will make a pretty decent temporary route for a couple months, as US-60 is 4 lanes, Charter Colony Parkway is 2 lanes on a modern alignment and cross-section, and Lucks Lane is 4 lanes between Charter Colony Parkway and Route 288. For north-south traffic in the far western corridor in the Richmond area, Route 288 obviates the need to utilize Parham Road and VA-150 Chippenham Parkway. The August 27th opening provides a total of 12.1 miles of Route 288 open between US-60 Midlothian Turnpike and I-64, providing the new James River crossing, and connecting to high-capacity 4-lane highways at either end, plus 5 other interchanges between US-60 and I-64. The 3.7 miles of Route 288 between Lucks Lane and US-60 Midlothian Turnpike in Chesterfield County, opened on November 19, 2004. Route VA-288's mainline was completed Friday, November 19, 2004, with the opening of the final section of Route 288, the 3.7-mile section between Lucks Lane and US-60 Midlothian Turnpike in Chesterfield County. This Thanksgiving the Virginia Department of Transportation (VDOT) and motorists who have been eagerly awaiting their first ride from Interstate 64 to Interstate 95 using Route 288 will have a lot to be thankful for. 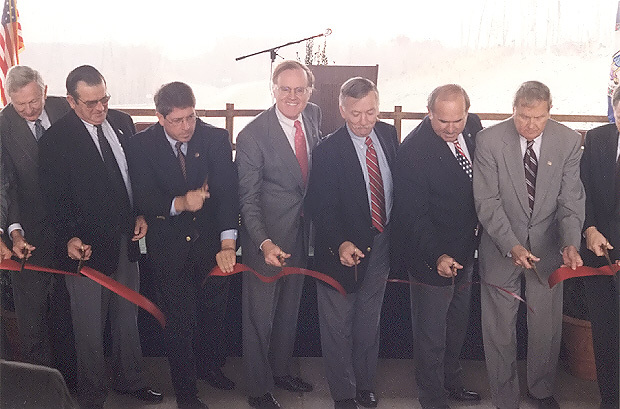 Friday morning area legislators, local officials and Secretary of Transportation Whitt Clement gathered to open the final portion of Route 288 between Lucks Lane and Midlothian Turnpike (Route 60) in Chesterfield County. The final link will allow motorists to make a continuous 32-mile trip from I-64 in Goochland County to I-95 in Chesterfield County for the first time. VDOT and Vecillio and Grogan, the contractor building the final portion of Route 288, have concentrated efforts to allow traffic to use this segment before the onset of the holiday season and winter weather. However, construction activities in this area of Route 288 may continue until mid 2005. Drivers can expect continued lane restrictions and reduced speed limits for the next several months and are urged to use caution when traveling through this area. The opening ceremony was at 10:00 that morning, near the Woolridge Road overpass, and about 150 people attended, there were speeches by Thomas Hawthorne, the Virginia Department of Transportation (VDOT) Richmond District Administrator; John Watkins, the state Senator for the region; Kelly Miller, the Chairman of the Chesterfield County Board of Supervisors; Lane Ramsey, the Chesterfield County Administrator; and Whittington W. Clement, the state Secretary of Transportation. The final ceremony act was a ribbon cutting. The 3.7-mile-long highway segment was opened at about 12:30 PM, and I was in the line of cars stopped by the police on Route 288 southbound approaching US-60 Midlothian Turnpike as the VDOT maintenance workers removed the barrels and then opened the highway segment to traffic. I drove the new segment southbound, turned around at US-360, and then rode the new segment northbound. The mainline pavement is continuously reinforced concrete pavement. Most of the segment has a 72-foot-wide graded median. The collector-distributor (C-D) roadways at VA-76 Powhite Parkway and Lucks Lane were fully opened, and the two northerly ramps at Lucks Lane opened, so now all ramps there are open. The collector-distributor (C-D) roadways at US-60 Midlothian Turnpike were fully opened, the two southerly ramps at US-60 opened, the two northerly loops at US-60 opened, so now all ramps there are open. Route 288 in Chesterfield County has continuously reinforced concrete pavement. There are some 55 mph speed restrictions on this segment as some construction is still underway, and when all construction is completed in few months, the speed limit will be 65 mph as it is on the rest of Route 288. Lots of traffic started using the new highway segment immediately, and remains busy on the various times I have driven it since then. It is a very nice highway and a pleasure to drive. There is a full cloverleaf interchange between VA-76 Powhite Parkway and VA-288 in Chesterfield County, with four loops and four outer ramps. The Route 288 interchange with Lucks Lane is a diamond interchange with two traffic signals on Lucks Lane at the ramp intersections, Lucks Lane was widened to four lanes divided as part of the current Route 288 project, and there are high-capacity movements with two or more lanes serving the ramps and Lucks Lane. Lucks Lane passes over Route 288. Collector-Distributor (C-D) roadways extend for two miles along Route 288, two lanes each on either side of the two-lane-each-way Route 288 mainline, and the C-D roadways intercept all the ramps for VA-76 Powhite Parkway and Lucks Lane, except for the southbound ramp from Route 288 to Lucks Lane which exits just before the southbound C-D roadway begins. These C-D roadways are built to full freeway standards, so Route 288 in this area is an 8-lane freeway on a 2x2x2x2 lane configuration. The VA-76 Powhite Parkway and Lucks Lane interchanges are 0.9 mile apart on Route 288. A future semi-directional ramp will replace the loop ramp between southbound Route 288 and eastbound VA-76, the project's design plans show this future ramp. Route 288 passes over VA-76 on four bridges, and these bridges are long enough to allow a pair of two-lane C-D roadways to be built on VA-76 in the future should VA-76 ultimately be extended 9 miles to US-360 in the Winterpock area, as has been proposed by Chesterfield County officials in the past, the four-lane freeway Powhite Parkway Western Extension. The only unopened portion of the project is the Woolridge Road interchange and connection, one mile south of US-60, in Chesterfield County. The Woolridge Road overpass over Route 288 is complete, and the 4 ramps are virtually complete. The one-mile-long 4-lane Woolridge Road extension between Charter Colony Parkway and Route 288, is under construction with about half of the asphalt base placed to date. The Woolridge Road extension includes a direct intersection with a John Tyler Community College property access road. The interchange has a spread diamond design, with space for four future loop ramps so that the interchange can be converted to a full cloverleaf design when the traffic volume warrants that. In the near future, Woolridge Road will be extended further west to VA-652 Old Hundred Road. The plan is to have this interchange opened to traffic by the end of 2004. US-60 Midlothian Turnpike, a 4-lane divided highway, has a full cloverleaf interchange with Route 288 in Chesterfield County, with collector-distributor (C-D) roadways on Route 288 to intercept all the ramp movements. US-60 passes over Route 288 on twin 3-lane overpass bridges. The southbound C-D roadway has 2 through lanes. The northbound C-D roadway has one through lane, and I surmise the reason for it being narrower than the southbound C-D roadway, is because a future semi-directional ramp will replace the loop ramp between northbound Route 288 and westbound US-60. The project's design plans show this future semi-directional ramp. A 1.0-mile-long section of 4-lane divided US-60 was reconstructed on an improved alignment, in the Route 288 interchange area, to provide an adequate highway in the interchange area. There is a US-60 third auxiliary lane between each pair of loop ramps, where they interface with each direction of US-60, and these auxiliary lanes are over 1,000 feet long, providing plenty of merging space with US-60. The following 5 photos were taken by the author on the November 19, 2004 opening day. 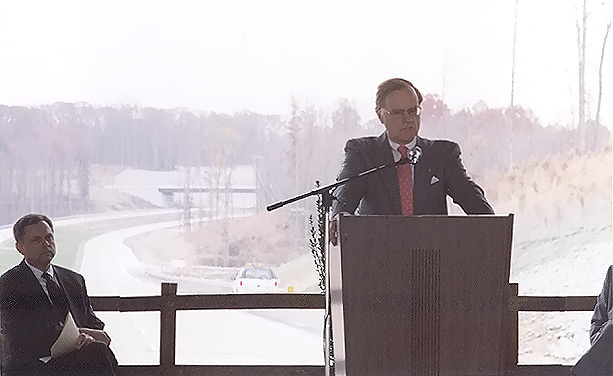 Virginia Secretary of Transportation, Whittington W. Clement, speaking at the dedication ceremony on November 19, 2004. The platform for the ceremony was on the Route 288 southbound roadway, underneath the Woolridge Road overpass, in Chesterfield County. Ribbon cutting at the dedication ceremony on November 19, 2004. Route 288, looking north from the Charter Colony Parkway overpass over Route 288, in Chesterfield County, a couple hours after the opening of the final segment. Looking north from where Charter Colony Parkway crosses Route 288. This photo was taken from the same vantage point as the previous photo, but it was taken with a 135mm (2.7x) telephoto lens, instead of the 50mm (1.0x) regular lens used previously. The interchange and overpass for Woolridge Road is visible in the distance. Route 288, looking south from the Charter Colony Parkway overpass over Route 288. The Woolridge Road interchange on Route 288, and the 0.9-mile Woolridge Road extension, in Chesterfield County, opened on January 13, 2005. The Woolridge Road interchange and the Woolridge Road extension opened to traffic on January 13, 2005, marking the completion of major construction on the 17.5-mile Western Route 288 project. The 0.9-mile Woolridge Road extension is a 4-lane divided highway, and it extends Woolridge Road from Charter Colony Parkway to Route 288. The Woolridge Road extension includes a direct intersection with a John Tyler Community College property access road. The interchange has a spread diamond design, with space for four future loop ramps so that the interchange can be converted to a full cloverleaf design when the traffic volume warrants that. In the near future, Woolridge Road will be extended further west to VA-652 Old Hundred Road. The Virginia Department of Transportation (VDOT) will open the new Route 288 / Woolridge Road interchange Thursday, marking the completion of major construction on the Route 288 project. Coinciding with the new interchange opening, VDOT will increase the speed limit on Route 288 near the new interchange to 65 mph. Speed limits in this area had been lowered to 55 mph while construction work continued. VDOT opened the final segment of Route 288 between Midlothian Turnpike and Lucks Lane in mid November 2004. At that time, the Woolridge Road interchange remained the only portion of the project not yet open to traffic. VDOT and Vecillio and Grogan, the contractor building this portion of Route 288, concentrated efforts since November to get the interchange open to traffic. Crews completed the final pavement marking and traffic signal work on Wednesday. The new interchange will serve motorists who currently access homes and businesses in that area of Chesterfield County using the Lucks Lane or Midlothian Turnpike interchanges and Charter Colony Parkway. The brand new interchange and approximately half-mile extension of Woolridge Road will provide new access to Route 288 and should alleviate some congestion from Charter Colony Parkway. The news release goes on to say that some minor construction work and lane closures may take place on Route 288 in spring 2005 as contractor crews complete the remaining incidental construction items on the project and demobilize from the three-year project. All of the mainline of Route 288 now has a speed limit of 65 mph. 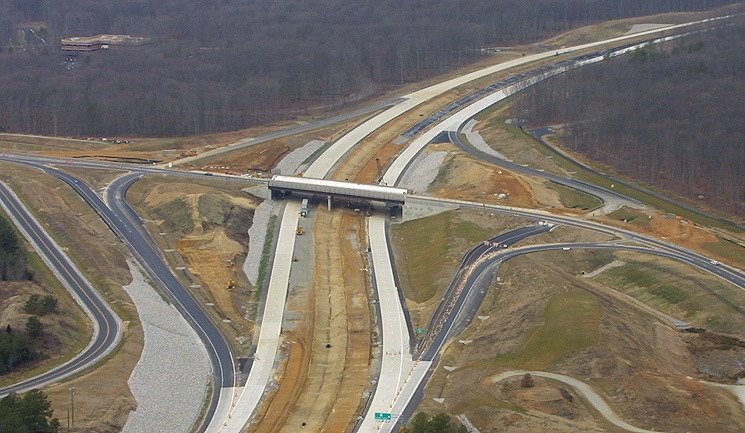 The $236 million APAC-Virginia PPTA project section of Route 288 was completed on-budget. This included building the 10.4 miles of Route 288 new 4-lane freeway between the Chesterfield County / Powhatan County line and Interstate I-64, plus the ultimate mainline roadways where there are collector-distributor (C-D) roadways on the VDOT-managed Route 288 projects, at the interchanges of Route 76 Powhite Parkway, Lucks Lane and US-60 Midlothian Turnpike; plus the ultimate 2-lane parallel roadway for Lucks Lane where it crosses Route 288. Record levels of rainfall in 2003 and 2004 caused the original schedule of completing the PPTA project section of 29 months, to take 41 months to complete. The PPTA agreement had a heavy penalty clause that specified damages of $25,000 per day, up to a maximum of $5 million, if the project was not "substantially complete" by Oct. 31, 2003. At the end of the project, the contractor team had a pending request for $10.6 million in additional compensation, citing a clause in its contract that addresses "significantly abnormal weather conditions". VDOT decided to forego its $5 million due for the project being 12 months late, in return for the contractor forgoing its request for the $10.6 million in additional compensation. The rains that delayed the opening of a key stretch of state Route 288 by nearly 10 months also washed away $5 million in damages against the contractor that performed much of the work. The Virginia Department of Transportation agreed to waive the payments as part of a settlement with APAC-Atlantic. In exchange, APAC, formerly known as APAC-Virginia and Koch Performance Roads, dropped its request for $10.6 million in additional compensation on the $236 million project. Thomas A. Hawthorne, VDOT's Richmond district administrator, said he was reluctant to give up on the damages but also said he didn't want to risk the matter ending up in court. "In essence, we preserved the project but removed the risk of VDOT being potentially liable for an additional $10 million in costs if it were to be litigated," he said. Deborah Galloway, a spokeswoman for APAC, commented briefly on the settlement. "In 2003, Virginia experienced one of the wettest years in recorded history, including a hurricane," she said. "We're very satisfied with how the project came out." The new section of Route 288 - which connects the outer suburbs west of Richmond - was one of the first projects built in the region under the Public-Private Transportation Act. APAC, based in Atlanta, was responsible for building the highway from Interstate 64 in Goochland County south to the Powhatan-Chesterfield line. VDOT's contract with APAC called for the section to be "substantially complete" by Oct. 31, 2003. After that, APAC faced damages of $25,000 per day, or a maximum of $5 million. APAC's portion of Route 288 was declared complete and opened on Aug. 27, nearly 10 months late. (A final stretch of the highway from Midlothian Turnpike south to where existing Route 288 ends at Lucks Lane is scheduled to open Nov. 19.) Hawthorne said APAC was generally on schedule until the rainy period started about May 18, 2003. By that September, he said, it had lost much of the construction season due to the weather. The company asked VDOT for more time and money to complete the project, citing a clause in its contract that addresses "significantly abnormal weather conditions." At first, VDOT denied the request on the basis that the contract excluded rain from its definition of abnormal weather. The agency later reversed itself and agreed to the settlement, which was outlined in a letter dated July 13, 2004, from Hawthorne to John P. McAleer, III, a vice president for APAC. In an interview, Hawthorne said the settlement kept the project's budget intact, which was one aspect officials could control. He also noted that APAC had gotten a late start on Route 288 because VDOT was not able to meet its deadline of July 1, 2003, to deliver all of the right of way. He attributed that delay largely to having to wait for a judge to settle a dispute with a landowner in Powhatan over the highway's path. "I feel very strongly it was a fair resolution," Hawthorne said. "Both of us got beaten a little bit on this." Looking back, Hawthorne said he's not sure VDOT should include abnormal weather in future PPTA contracts as a basis to waive damages. "In this case, I think we did have an abnormal weather event," he said. "That's a fairly subjective term, and it's open to a lot of interpretation." "In any way you look at these things, you're assigning risk," he added. "The more risk the contract takes, the more you expect to pay. In the end, it may not make any difference as to what the final cost may be." Construction began in January 2001 on the 4.5-mile-long segment of VA-288, between 0.5 mile south of Charter Colony Parkway and the Chesterfield/Powhatan county line, including the US-60 Midlothian Turnpike interchange and the Woolridge Road interchange. The contract award amount was $47.6 million, and the final cost will be $58.3 million, a $10.7 million increase in cost. Construction Company - Vecellio & Grogan, Inc.
Construction began in spring 1999 on the $25.2 million 2.8-mile-long section of VA-288 between 0.9 mile south of VA-76 Powhite Parkway and 0.5 mile south of Charter Colony Parkway in Chesterfield County, and completion occured in November 2002, with opening to traffic of the 0.9 mile of VA-288 between VA-76 and Lucks Lane (actually on the collector-distributor roadways, as the mainline roadways north of VA-76 were not open at that point). This project was completed at $30.8 million, or a $5.6 million increase in cost. So the total award cost of the three projects was $308.8 million, and the final cost was $325.1 million, a 5.3% increase in total cost, well within the 10% in the budget allowed for contingencies. The two smaller projects were each over the 10%, but the $236 million PPTA project, which comprised 76.4% of the award cost of all three projects, was completed on-budget at $236 million. Public sector contracting typically has 10% allowed for contingencies. Contingencies refers to additions and revisions to the contract during construction, and the usual industry standard is that 10% be allowed for contingencies on a highway project; for example, if the engineering estimate was $10.0 million for a particular project, that the project would be budgeted for construction in the TIP at $11.0 million, with up to $1.0 million budgeted for possible change orders needed during construction. This shows that even the best project engineering estimates have a significant amount of uncertainty acknowledged as part of the process of heavy construction contracting. Route 288 is named the World War II Veterans Memorial Highway, along its entire length between I-95 in Chesterfield County and I-64 in Goochland County, and the twin-span 3,642-foot-long Route 288 James River bridge is named the World War II Veterans Memorial Bridge. The names are conspicuously displayed on large green highway signs, southbound near US-250, southbound at the north end of the James River bridge, southbound just south of VA-76 Powhite Parkway, northbound just north of US-1/US-301 Jefferson Davis Highway, and northbound at the south end of the James River bridge. About 300 veterans, business leaders and state and local officials gathered just north of the Route 288's bridge in sporadic, light rain for the bestowing of what some described as an overdue honor on those who fought and, in many cases, lost their lives during World War II. They described the veterans as honest, hardworking and humble. "How blessed we are to have that 'greatest generation' serve each and every one of us," said Michael E. Harris, commander of the American Legion Department of Virginia. "Imagine what kind of man will be lost when the last World War II veteran is gone," said Floyd B. Callihan, a World War II veteran from Goochland County who first suggested naming Route 288 for the veterans. With yesterday's ceremony, the regional highway slicing through the suburbs west and south of Richmond will be known as the World War II Veterans Memorial Highway. At yesterday's event, a sign was uncovered recognizing the bridge between eastern Powhatan and Goochland counties as the World War II Veterans Memorial Bridge. State Sen. Walter A. Stosch, R-Henrico, called the tribute a "small token of immense gratitude." He was a patron of a state bill to name the roads and bridge. Stosch called Route 288 and its bridge strong, durable and beautifully capable of increasing mobility and spurring economic growth in the region. William Harris, a World War II veteran who participated in the D-Day invasion of France and now lives in Henrico County, said he's felt forgotten at times over the years, especially when highways or bridges were named for veterans of other wars. "This is a nice memorial," he said. Charles Smith, a Korean War veteran who lives in Mechanicsville, agreed. Route 288's final two sections are expected to open in the near future. The stretch from state Route 6 in Goochland to Midlothian Turnpike in Chesterfield is expected to open late this month. The segment from Midlothian to where existing Route 288 ends at Lucks Lane in Chesterfield is to open during the fall. I attended the August 13, 2004 renaming ceremony, which was held on a platform about 100 feet north of the north end of the southbound Route 288 James River bridge. Access was via the VA-711 Huguenot Springs Road interchange about a mile south of the river, where vehicles entered the highway northbound, crossed the James River bridge, and were directed to angle parking on the highway just north of the river. So I was able for the first time to drive the new highway on the 3-mile section between VA-711 and VA-6 Patterson Avenue. The twin-span James River bridge is 3,642 feet long, mainly over flood plains as the river is about 500 feet wide at that point, and it is a scenic ride, and the distance seemed longer than I thought it would be. This segment of the highway opened to traffic on August 27, 2004. The weather was threatening, with the remnants of tropical storm Bonnie causing periods of rain that morning. So, many people at the ceremony opened their umbrella during periods of rain, which for the most part was light rain. It was a nice ceremony, and over 200 WWII veterans were there, dressed in their military uniforms and hats. Several WWII veterans gave speeches, as did several state legislators and several local officials. Most of the WWII veterans were from the Goochland American Legion, and the "draw" of WWII veterans was mainly from the local area, specifically the area just west of Richmond where Route 288 passes through. The ceremony included presentation of the colors by the veterans, singing of the national anthem by a local singer, rifle volleys, and taps. 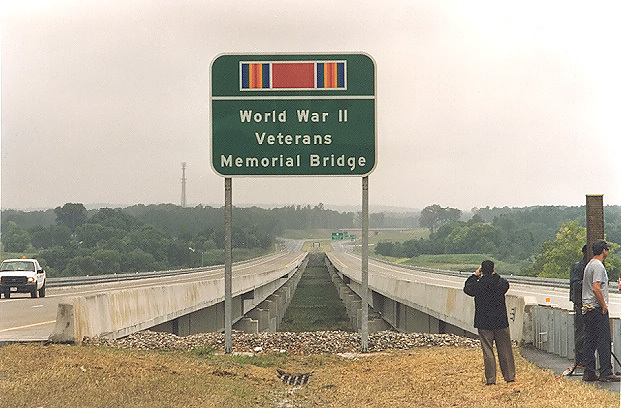 A large highway sign was unveiled at the end of the bridge, and it has the WWII campaign ribbon, and the name World War II Veterans Memorial Bridge. The south end of the bridge will have one also. 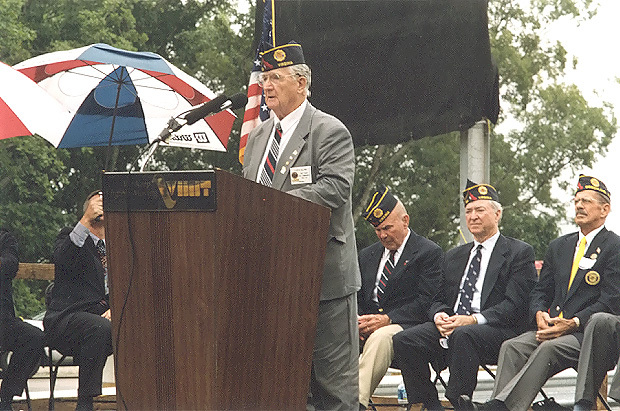 Floyd B. Callihan speaking, he is a World War II veteran from Goochland County, and he was the first to suggest naming Route 288 for the WWII veterans. He is the former State Vice Commander of the American Legion. Route 288 southbound, the James River bridge. The platform for the dedication ceremony is about 50 feet behind me. The sign was unveiled a few minutes before I took this photo, The twin-span 3,642-foot-long Route 288 James River bridges are visible, and in the far distance the VA-711 Huguenot Trail overpass and interchange is visible. See my article Route VA-288 Construction - August 2004 for more photos of the renaming ceremony. Here's a .pdf showing a plan view of this section of Route 288 and the two interchanges. Its size is 1,718 KB, but it shows the details -- Route 288 Construction Project Sections D and E, which is linked from Route288.com (VA 288) - Project Maps. The contractor project team put plan view sheets of the Route 288 project and its interchanges and connecting roads, on their website. They are in .pdf version, so you can select portions of a page with your mouse, and zoom in for more detail. See the link Project Maps, and click links on "Detailed Maps". Project map from VDOT public information brochure (by permission). Click for large map image: Large (267K). 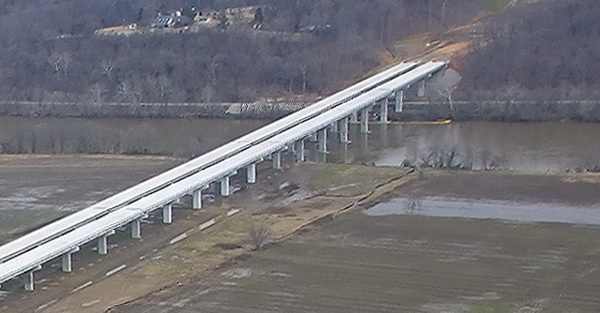 There are two excellent aerial photos of the new VA-288 James River Bridges on this article The VDOT News Center: Construction Project Photos which is on the VDOT website. With regard to the value of public-private partnerships being used to build transportation projects, a recent Federal Highway Administration (FHWA) study on public-private partnerships concluded that they can perform better than 100% public sector projects in some instances. Public-private partnerships can generate substantial benefits for public agencies interested in encouraging innovation and saving time and money on projects. Risk aversion and lack of experience with the private sector, however, often drive public agencies to spend considerable time and resources developing systems for soliciting projects, ensuring adequate competition, and allocating the risks associated with designing, constructing, and operating a large transportation facility. Cost and time-savings associated with public-private partnerships are more readily quantifiable. Two reports and numerous case studies have found that public-private partnerships can save from 6 to 40 percent of the cost of construction and significantly limit the potential for cost overruns. The reason for these savings is that the private sector often has more appropriate incentives to limit costs than the public sector. In addition, having one entity responsible for design, construction, and operation can result in efficiencies that are not possible with traditional design-bid-build methods. Public-private partnerships help reduce the time it takes to build a project in two ways, through innovative finance and project management. The most significant time-savings generated by public-private partnerships are a result of innovative financing. By restructuring project financing and borrowing funds, public-private partnerships can cut many years off project delivery. Although frequently less dramatic, innovative project management also reduces the time it takes to finish a project, often saving months if not years. PPTA is a Virginia procurement process, the Public-Private Transportation Act of 1995. The Public-Private Transportation Act of 1995 is the legislative framework enabling the Commonwealth of Virginia, qualifying local governments and certain other political entities to enter into agreements authorizing private entities to acquire, construct, improve, maintain, and/or operate qualifying transportation facilities. Passage of the Act, which took effect July 1, 1995, followed a year-long collaboration among the General Assembly, representatives from the private sector, and the transportation agencies. PPTA has a fine record so far with respect to successfully delivering huge transportation projects, with respect to schedule and budget. Route 895 Pocahontas Parkway, a 8.8-mile-long freeway built 1998-2002; 92% private funding, the project was awarded at $324 million, to be completed in 44 months, and they completed it at $314 million, which is $10 million under budget, and in 49 months, by Fluor Daniel/Morrison Knudsen, LLC (FD/MK). Western Route 288 Richmond beltway, a 17.5-mile-long freeway built 1999-2004; 100% public funding, the largest section of the project was awarded under PPTA in May 2001 at $236 million, to be completed in 29 months, and they completed it at $236 million, which is on budget, and in 41 months, and the extra time is reasonable given that near-record levels of rainfall occurred in 2003 and 2004. By APAC-Virginia, Inc.
Dulles Greenway (built under the Virginia Highway Corporation Act of 1988, a one-time version of what later became PPTA), a 14-mile freeway built 1992-1995; 100% private funding, completed six months ahead of schedule, and on-budget of $350 million, by Kellogg Brown & Root, Inc. Someone may argue that three out of three successes doesn't prove that all will be as successful, but I think it is a very good track record for three huge highway projects. The Route 288 example shows that PPTA can be used for a 100% public funded project, and they built a lot of freeway on-budget for a reasonable cost. The VDOT Six Year Improvement Program for Fiscal Year 2005 to 2010 was published June 15, 2004, and on page 15 it lists estimated costs for the 17.5 miles of Western Route 288 projects. There will be final adjustments, but these figures should be very close to what the final costs will be. I took the 581 photos on the construction photo articles linked below, and they track the construction of the 17.5 mile Western Route 288 project on a month-to-month basis. I posted these monthly articles while the project was under construction, within 4-8 weeks of taking each monthly group of photos. Copyright © 2001-2005 by Scott Kozel. All rights reserved. Reproduction, reuse, or distribution without permission is prohibited.